A Smashing Time in Amsterdam! Home/2017, Members, Sport/A Smashing Time in Amsterdam! Last June was a month full of celebrations for our member club Smashing Pink. For the 25th time the annual international Pinkster Tournament was organised by a group of enthusiastic volunteers. 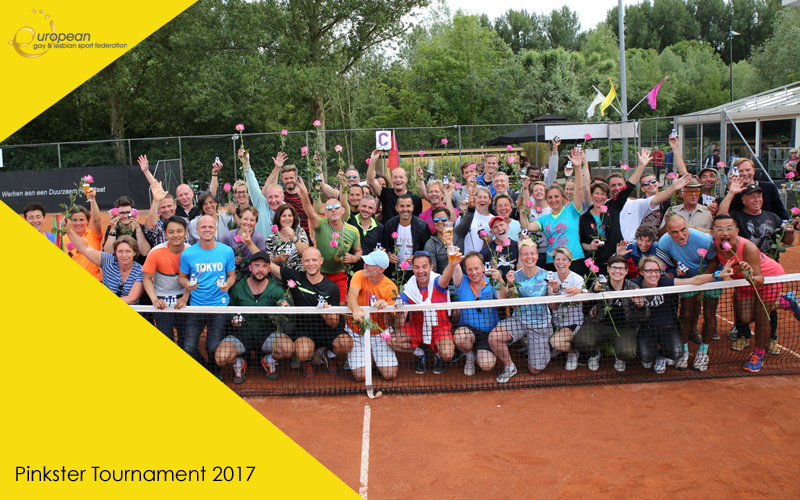 With about 400 participants the Pinkster Tournament is still Europe's largest LGBTIQ-tennis event. After it's 4th edition in 1996, the first European gay & lesbian tennis club Smashing Pink was founded. A few months later the club became a member of the Dutch Tennis Association KNLTB and started to compete in the Dutch tennis competition. For years Smashing Pink has contributed to the respect towards, visibility and acceptance of LGBTIQ-people in sports in Amsterdam. This was also seen by the Sport Council of the City of Amsterdam, and therefor Smashing Pink was awarded with the 'Penning Sportraad van Amsterdam'. This award is given to a person or organisation, who has contributed in an extraordinary way to sports in general, by showing guts, vision, and ambition. The board of EGLSF was represented at this special edition of the Pinkster Tournament by Co-chair Annette Wachter, Treasurer Edgar Castillo and board member (and one of the tournament directors) Diana van den Born. The EGLSF congratulates Smashing Pink and the PinksterTournament with these special achievements.